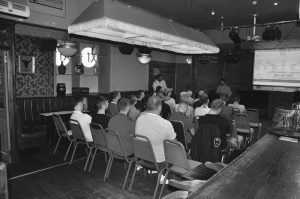 On 13 July 2018, Brian Hendry Interiors Ltd hosted its bi-annual Employee Forum at The Butterfly and The Pig restaurant in Glasgow. With numerous items on the agenda, from a review of past projects to the discussion of health and safety on site and opportunities to upskill—this was an excellent way to ensure our staff remain informed and engaged with company developments. It also provided the chance to reflect on the company’s progress in 2018 and to acknowledge the success that has been achieved. For example, in February 2018, John Ramsay received the Outstanding Employee Award at the FIS President’s Lunch, which was hosted at Plaisterers’ Hall, London. Currently our Project Supervisor, John has demonstrated exceptional commitment, working with the business since its establishment in 2004. He has also contributed to the success of numerous high profile contracts from The Royal Commonwealth Pool to the British Museum (London) and Dunedin House Development in Edinburgh. Additionally, the company’s recent success at the 2018 FIS Awards Lunch was addressed, with the Gold Award in the suspended ceilings category a testament to the hard work of all staff who contributed to the project. By sharing the details of these awards at our forum, it is hoped that they will inspire our staff to continue to deliver high quality workmanship on all future projects! A record that Brian Hendry Interiors Ltd is equally proud of is its commitment to reduce the environmental impact of our operations and to promote resource efficiency. The company was first recognised as an Armstrong Green OMEGA Specialist Ceiling Contractor in 2016, following the recycling of off-cut ceiling tiles during its works for main contractor Morgan Sindall at the Maryhill Health Centre. Furthermore, in 2017, we prevented around 4.0 tonnes of material from being deposited in landfill waste by conducting off-cut recycling. Discussing our environmental commitment at this Employee Forum provided an opportunity to both commend and encourage continued efforts towards decreasing the quanti ty of waste going to landfill. 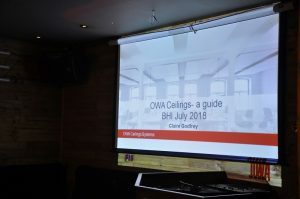 Finally, in recognition of the importance of keeping our workforce up to date with current trends and products, we were pleased to welcome Claire Godfrey, Technical Sales Manager for OWA (UK) Ltd, who delivered a presentation on the technical aspects of fire and acoustics within the ceilings industry. We thank her for her valuable contribution to our forum. Overall, the July 2018 Employee Forum was a success and we look forward to our next meeting to be held in December!